It’s that time of year many of us have been waiting for – the Big Game. Whether you are in it to the football, the food or both, this weekend is the perfect reason to celebrate. 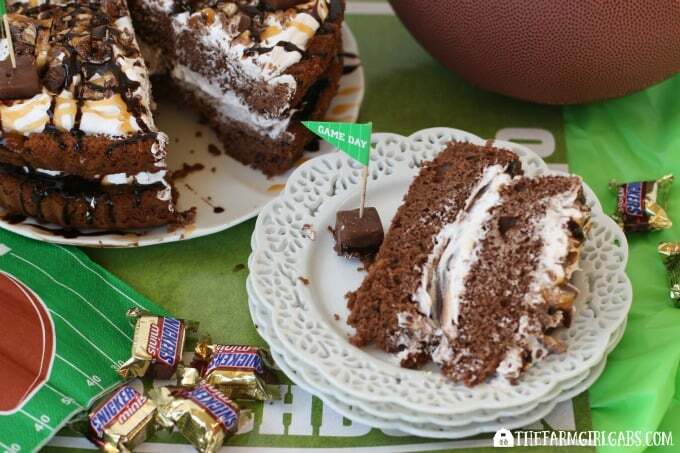 Score a touchdown at your game day party with this delicious SNICKERS® Chocolate Dream Dessert. 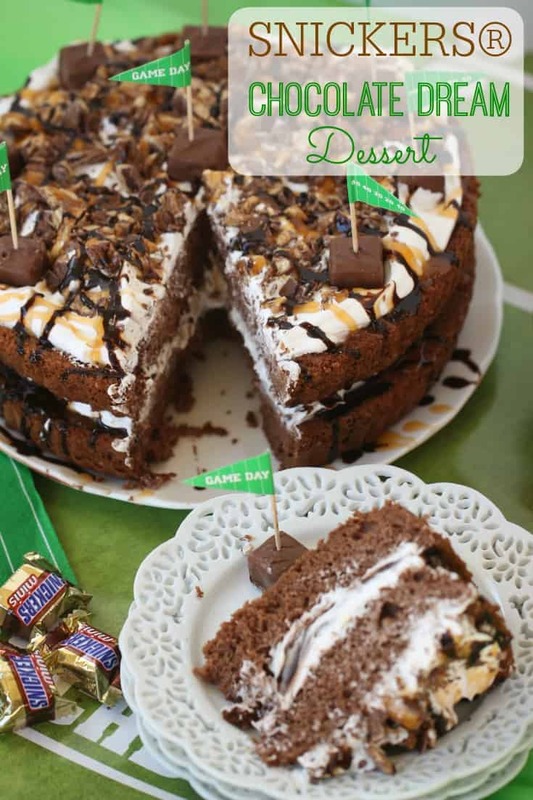 This decadent dessert centers around my favorite candy, SNICKERS®, and is the perfect sweet ending to your game day party. While we are all huge football fans in my house.The glory of the game is equally important as the glory of the food. A great game day spread is a perfect way to bring people together, especially those who are not football fans. Food is always a perfect reason to celebrate anything! For my game day gatherings, I like to stock up with snacks and beverages I know my guests will enjoy, like SNICKERS® Minis, Skittles® XL, Pepsi™ 12 oz. 12 pack, TOSTITOS® Scoops Party Size and TOSTITOS® Medium Chunky Salsa. Along with all the savory dishes and snacks featured at any party, a sweet ending is always necessary. This SNICKERS® Chocolate Dream Dessert is so simple to make. Here is how I assembled it. I prepared one box of chocolate cake mix and baked in two nine-inch cake pans. I used a special torte pan, but a plain old nine-inch pan will work just fine. While the cakes are baking, I chopped up a few cups of SNICKERS®. I tried very hard to keep the candy on the cutting board and not in my mouth. SNICKERS® are my favorite, after all. I also prepared the chocolate pudding for the filling. Now it’s time to put everything together. Place one chocolate layer on a dish. Spread the chocolate pudding, followed by half of the whipped topping. Sprinkle with a generous handful of the SNICKERS®. Then, drizzle some hot fudge and caramel syrup. Top with the other chocolate layer cake and spread some more whipped topping and SNICKERS®. Finish it off with some more hot fudge and caramel syrup. 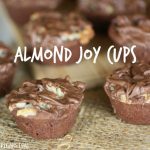 All of the ingredients for this recipe, including the SNICKERS® Minis, is available at Wal Mart. Be on the look out for specific game day displays where you can find SNICKERS® Minis, Skittles® XL, Pepsi™ 12 oz. 12 pack, TOSTITOS® Scoops Party Size and TOSTITOS® Medium Chunky Salsa. 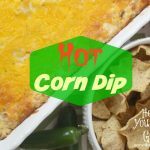 Looking for more game day party ideas? You can click here for more game day glory inspiration. You can also build your own snack stadium and Enter the #gamedayglorysweepstakes for a chance to win a $100 Walmart eGift card or Xbox One. Share a photo of your own snack stadium on Instagram using “#gamedayglorysweepstakes” for your chance to win.Game Day Glory Sweepstakes. 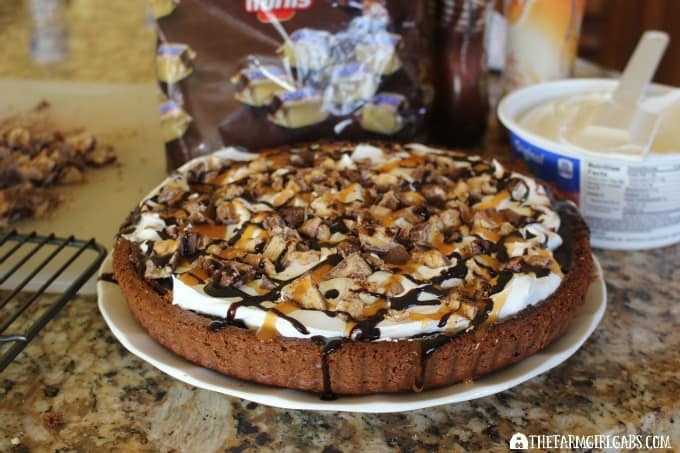 Score a touchdown at your game day party with this delicious SNICKERS® Chocolate Dream Dessert. It's the perfect sweet ending to your Game Day party. Prepare cake mix in two nine inch cake pans according to package directions. 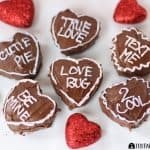 Bake and cool completely. While cakes are baking, mix pudding with 1 2/3 cup of milk. Using less milk will make the pudding thicker and more stable. To assemble, place one cake on a serving dish. Top with chocolate pudding and then with half of the whipped topping. Sprinkle a generous handful of the chopped SNICKERS® Minis over top. Drizzle with hot fudge and caramel syrup. Top with the other cake layer. Spread remaining whipped topping and chopped SNICKERS® Minis. Drizzle with more caramel sauce and hot fudge. Garnish with whole SNICKERS® Minis. If this decadent doesn’t bring glory to your game day party, I don’t know what will. It’s the perfect touchdown sweet ending! Enjoy the game.